Knowing how to end a maid of honor speech is key to making it a memorable and touching moment for the bride and groom. The maid of honor toast is one duty that will throw you in the spotlight unlike the other maid of honor duties carried out "behind the scenes." A few helpful toast writing and speaking tips along with great examples of ways to end your speech ensure you'll make the perfect maid of honor toast. Introduce yourself to the guests and tell them your relationship to the bride. Offer a short memory or two of the bride in her youth. Mention both the bride and the groom in the toast. While most of the toast is directed towards the bride, you should remember to offer congratulations to both of them. Write how you speak. This is not the time to be following proper essay or report writing guidelines. You want the words to sound natural when you say them aloud. Even though you want to write your full toast out, do not bring the entire copy to the wedding reception. Instead, write down a few key points that will help you remember each topic. Take a few sips of water before standing to speak. You do not want to have cottonmouth or a cough while talking. Smile while you are giving the toast. The wedding is a happy occasion. Look at the guests, but remember to glance at the bride, too. Look at the bride and groom if addressing them personally. Feel free to use some hand gestures if you naturally do when speaking; otherwise, keep your hands at your side, resting on a podium/table or hold a glass. If you are incredibly uncomfortable with public speaking, talk to the bride. She may not feel strongly about having the maid of honor give a long-winded speech. Options you could present include saying the opening and closing remarks for the toast or handing over the duty to a bridesmaid who is more naturally suited to being in the spotlight. However, wedding speeches are a tradition for maids or matron of honor, so be prepared to deliver at least a short wedding toast. Please raise your glasses in honor of Bride and Groom. Join me in honoring the marriage of Bride and Groom! With love and happiness, here's to you, Bride and Groom! Cheers to the happy newlyweds! May you love each other more every day you spend together! Let us toast the happiness of Bride with her new husband, Groom! Best wishes and years of bliss to the new couple! What a wonderful wedding day indeed, so let's raise our glasses to wherever their lives may lead. Even if you do not drink wine or champagne, have a glass ready to raise at the end of your speech. This way, everyone understands that the speech is over and they are ready to toast the bride. Pick up the glass a few moments before ending the toast and then raise your outstretched arm to eye level. Take a sip of your drink after completing the whole toast. Giving maid of honor toasts is a tradition honored at many weddings. 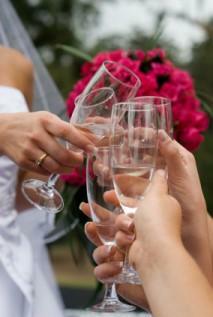 Offer the bride and her new husband wedding wishes in a toast that honors the new life they are embarking upon.